Pope Francis will be in the District this fall. Photo by George Martell/Pilot New Media used under a CC BY-ND 2.0 license. Boston may have beaten D.C. for the nation’s bid to host the 2024 Olympics, but residents will have the chance to see Pope Francis next fall. The head of the Catholic Church announced Monday that he would visit New York and D.C., in addition to Philadelphia, when he makes his first papal trip to the United States in September. The 78-year-old pontiff plans to celebrate mass at the Basilica of the National Shrine of the Immaculate Conception, the largest Catholic church in the country, on Catholic University’s campus, NBC News reported. Though his itinerary hasn’t been finalized, he could also visit the White House, Ground Zero and the United Nations headquarters. 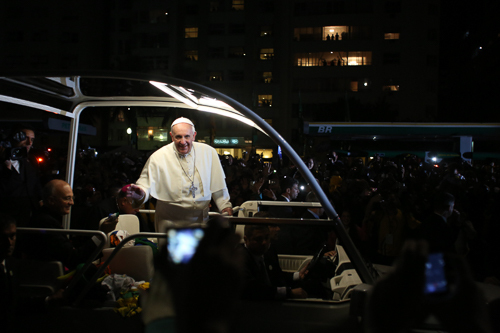 Francis has visited 10 countries since he was elected to the papacy in 2013, including Brazil and South Korea. He returned to the Vatican early Monday after a week-long trip to Sri Lanka and the Philippines. He also plans to visit South America and France before traveling to the United States.